Cloverleaf Blanket Answer works in all temperatures, and seeks to succeed where many commercial bacteria cultures will fail. It is 100% safe for all pond fish, plants and biological filtration systems. UV systems and Protein Skimmers do not need to be switched off. Unlike some products, Cloverleaf Blanket Answer is not dependant upon water temperature, and is not held back or restricted by high pH levels. Cloverleaf Blanket Answer is simply added to the pond by sprinkling the powder evenly over the surface, or added to a bucket of pond water and then poured evenly over the ponds surface. The water will initially take on a milky white apperarance, but this will clear after 3-5 days. The composition of the ingredients will form as a powdery layer on the ponds liner faces, and it is here that the roots of any blanket weed gets attacked. As with most water treatments the pond should have a good level of oxygen saturation, which should exist without generating an undue turbulent situation throughout the pond that would prevent the Cloverleaf Blanket Answer ingredients from settling onto the weed or liner. During and after applying Cloverleaf Blanket Answer, common sense should prevail in the washing of hands, and storing the Cloverleaf Blanket Answer in a dry place away from the reach of children. Although no known dangers are thought to exist the application to the pond of any other chemical or treatment should be spaced 10 days from applying the Cloverleaf Blanket Answer. 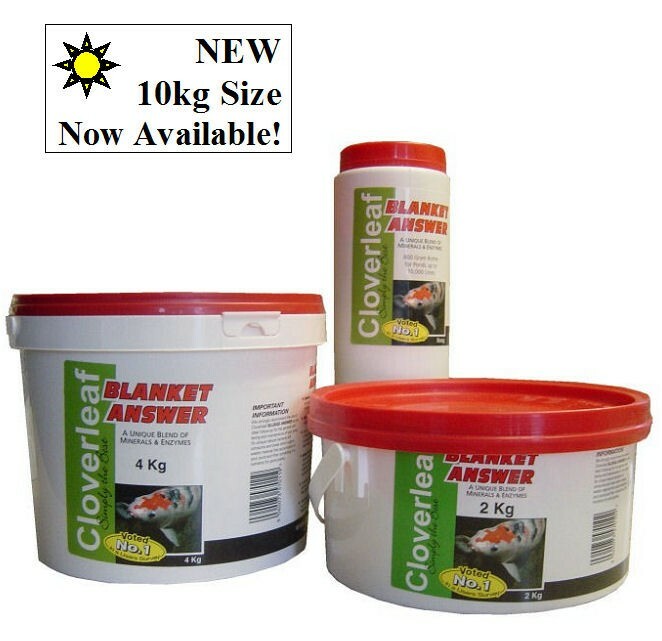 We strongly recommend the use of Cloverleaf Sludge Answer as the ideal follow-up for the general well being and maintenance of your pond. Its unique natural bacteria will consume and break down organic waste material that accumaltes in your pond and filter converting it to nutrients for ponds plants. ♦ In most cases one single dose is all you require but additional treatments can be added as required.